John Matthews is the community's namesake. Arriving in 1827, Matthews bought land from one of Stephen F. Austin's original colonists and established a plantation. The 140-slave plantation prospered prior to the Civil War and following the war, Matthews' freed slaves and those of other nearby former plantations created a market for goods and services. The community formed around the former plantation and by 1880 the town had a gin, blacksmith and general store. The town briefly had a post office in operation from 1895 to 1905. Thereafter it was routed through nearby Eagle Lake. By 1900 Matthews had a population of 100 with a school and four businesses in operation. The same population was given for the next six decades. Matthews appears on detailed county maps - but no population figures are available. The two nearest cemeteries to Matthews are the Union Hill cemetery and the Mt. Zion cemetery - both on county roads within two miles of town. 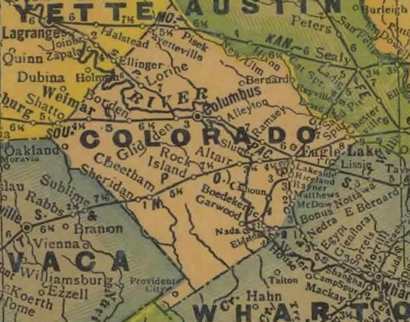 1940s Colorado County map showing Matthews SE of Columbus, S of Eagle Lake. Courtesy Texas General Land Office.